I am wanting to know if MD Medicine Degree (2 years course) of University of Buckingham (UK) is recognized in India or not. What is the quality of education imparted there? If anyone having more idea about this university of UK please let me know. I am trying to get some concrete info about this University. What I have managed to get information from RxPg and other sources is that MD Medicine of Univesity of Buckingham WILL NOT BE VALID IN INDIA as the college is not listed in IMED. But the University's website mentioned accreditation by the Govt of India and MCI. Gotta ask someone from the MCI. Yes its expensive but when you compare it with seats offered in management quota in India (in tune of 1.4 crores to 1.7 crores), I think its not that expensive. Medical organisations in the UK have neither the power nor remit to quality assure MD or PhD degrees taken by physicians. This includes the General Medical Council (GMC) and the Royal College of Physicians. The University of Buckingham School of Medicine has been accepted by the GMC as a Postgraduate Institution Sponsoring Body. This enables the University to sponsor selected candidates enrolled on the MD programmes for full registration with the GMC without the need to pass the PLAB examination. Application for sponsorship for full registration will be made by the University to the GMC after the candidate has completed their first three months of the programme. This will enable successful candidates to proceed with the MD programme with full GMC registration, thereby enhancing their clinical training and experience. The University of Buckingham does not currently appear on the GMC list of approved medical schools, or in the World Directory of Medical Schools as only those that offer undergraduate medical qualifications feature on these lists. Buckingham�s undergraduate medicine programme is currently being created, and it is our intention to seek recognition from the GMC for this. However, the GMC has yet to make any assessment of our curriculum. Yes this is a direct copy from the Universities website. It also says that its MD degree is recognised by Govt Of India and MCI. Do you have any info on that? yes I would try to forward an application to the MCI asking for the details over MD Medicine at University of Buckingham under RTI act. What's the procedure n prerequisite to do an MD here? Sure. Let me first file the application and get some reply from them. Is Buckingham the only college? May be in pvt practice bt ive heard its not recognized... Its useful just on your CV. 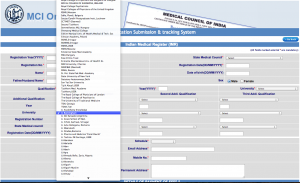 Dr, did you got any response from MCI under the RTI act? I am also curious whether the graduates from Buckingham are eligible for DM in India and other countries? There was no good response from them. More over its for sure that the MD degree from this university is not recognised officially. I wonder how can the university claim falsely of this on their website. I had applied for MD clinical Medicine at Buckingham University, I think University of high reputation will not publish false information about MD degree recognition at IMC India and this information is for long time there, if it was false than MCI could have taken legal action till now.I enquired from my friends working in UK about this University & I got go ahead signal from them.But still I'm trying to find out more information. 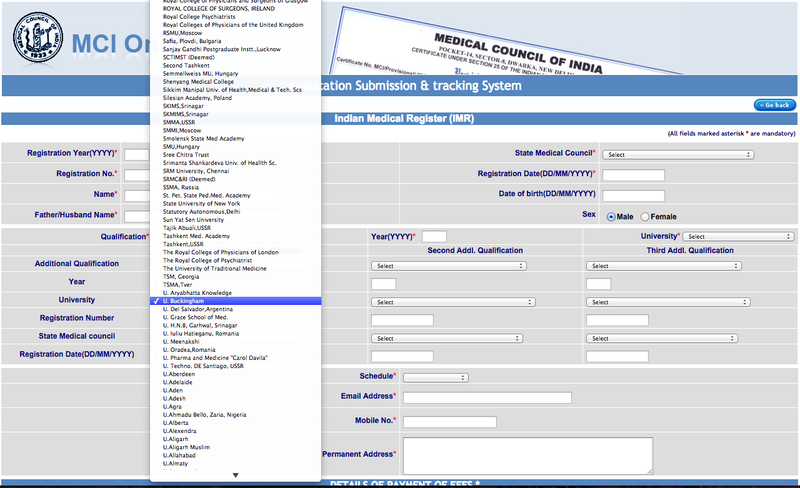 This is a screenshot from MCI website when we start the registration for "additional qualifications". The MCI's website "does list" the University of Buckingham as "U.Buckingham" and recognises it as postgraduate qualification.